Christmas is always observed on December 25th. Christmas is a Christian holiday celebrating the birth of Jesus Christ. Decorating houses and yards with lights, putting up Christmas trees, giving gifts, and sending greeting cards have become traditions even for many non-Christian Americans. In the third century, efforts were made to find out the date of the Nativity, but only in the year 336 was the date of the December 25 festival set in commemoration of Jesus' birth. Pope Julius formally selected December 25 as the day of Christmas in 349 A.D.
Roman Catholics, Lutherans, members of the Dutch Reformed and Anglican churches, and those of the German sects were most responsible for establishing Christmas traditions in America. Christmas customs spread with the westward expansion of the United States and by the late 1800s had become firmly entrenched in American society. 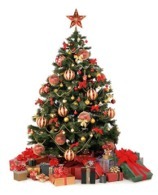 The Christmas Tree is a German tradition, started as early as 700 A.D. In the 1800s the tradition of a Christmas tree was widespread in Germany, then moved to England and then to America through Pennsylvanian German immigrants. In Victorian times, people had already started decorating trees with candies and cakes hung with ribbon. In 1880, Woolworths first sold manufactured Christmas tree ornaments, and they caught on very quickly. Martin Luther, in the 16th century, is credited as being the first person to put candles on a tree, and the first electrically lighted Christmas tree appeared in 1882. In 1923, Calvin Coolidge ceremoniously lit the first outdoor tree at the White House. Santa Claus started with a real person, Saint Nicholas, a minor saint from the fourth century. Nicholas' reputation for generosity and kindness gave rise to legends of miracles he performed for the poor and unhappy. In the Middle Ages, devotion to Nicholas extended to all parts of Europe, but eventually faded in all the Protestant countries of Europe except Holland, where his legend persisted as Sinterklaas (a Dutch variant of the name Saint Nicholas). Dutch colonists took this tradition with them to New Amsterdam (now New York City) in the 17th century. Sinterklaas was adopted by the country's English-speaking majority under the name Santa Claus, and his legend of a kindly old man was united with old Nordic folktales of a magician who punished naughty children and rewarded good children with presents. Glory to God in the highest, on earth peace, good will toward men. Holiday Season Safety - The National Safety Council offers suggestions to help make your holiday season merry and safe. Also see Christmas Tree Tips.